DiffPDF is used to compare two PDF files—textually or visually. This tool is no longer being developed or maintained. It has been superceded by our commercial GUI applications, DiffPDF and comparepdfcmd. These provide more functionality and are faster on multicore machines. 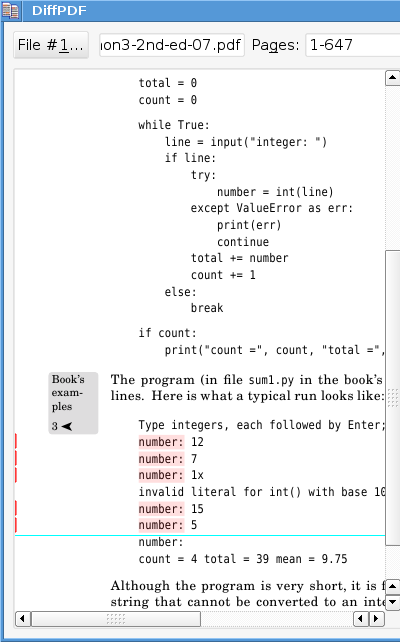 DiffPDF can compare two PDF files. It offers three comparison modes: Words, Characters, and Appearance. By default the comparison is of the words on each pair of pages, but comparing character by character is also supported (e.g., for logographic languages). And there's also support for comparing the pages by appearance (for example, if a diagram is changed or if a paragraph is reformatted, or a font changed). It is also possible to compare particular pages or page ranges. For example, if there are two versions of a PDF file, one with pages 1-12 and the other with pages 1-13 because of an extra page having been added as page 4, they can be compared by specifying two page ranges, 1-12 for the first and 1-3, 5-13 for the second. This will make DiffPDF compare pages in the pairs (1, 1), (2, 2), (3, 3), (4, 5), (5, 6), and so on, to (12, 13). 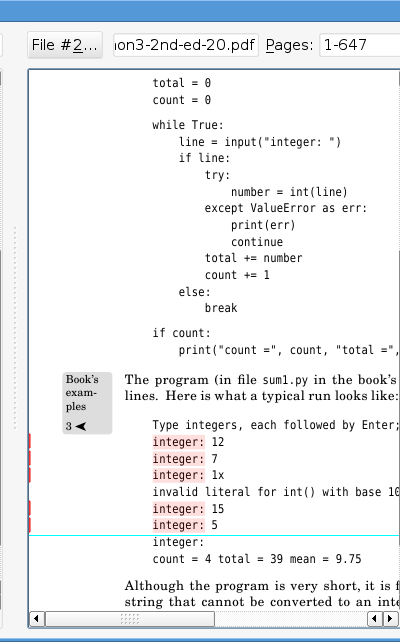 Version 1.5.0 added the ability to save a PDF file that shows the pages that differ with their differences highlighted. Version 2.0.0 added support for margin exclusion and improved dock window handling. Version 2.1.0 added support for drag and drop, bug fixes, and French and German translations. PDF files can be loaded from the GUI (by pressing the File #1 and File #2 buttons, or by dragging and dropping files), or by specifying them on the command line. I use the tool regularly to compare different versions of my books (which are typically 500 or more pages), e.g., comparing a first printing with a second printing, to make sure that only the pages I intended to change have actually been changed. If you want a command line tool (e.g., for automated testing), use comparepdfcmd instead. DiffPDF is licensed under the GNU General Public License v 2 open source license. I no longer provide pre-built binaries for Mac OS X or Windows. Windows users are recommended to use the commercial DiffPDF instead. If you like DiffPDF, you might like to buy one of my books. I also provide training in Python, PySide, and PyQt. Your Privacy • Copyright © 2006 Qtrac Ltd. All Rights Reserved.